In 45 days, I will finally be able to say that I'm a published author. And I'm so excited. Five months ago, I experienced three tragic things to happen in my life. I lost my dream job at Google, found myself at the Mandalay Bay on the night of the Las Vegas shooting (he was shooting directly above us) and then I lost my best friend, Ms Bonnie. All three of these things happened within a three-week period. I was devastated to say the least. But something beautiful happened! I ended up writing my first book about my autism journey in raising my son Cameron, who has Asperger's Syndrome. Being forced to navigate the world of Autism was one of the hardest things I ever had to face. But Cameron not only survived, he thrived. Cameron graduated from High School last June and is now attending college. He has become this smart, confident young man who refuses to be labeled by his autism. I couldn't be more proud. 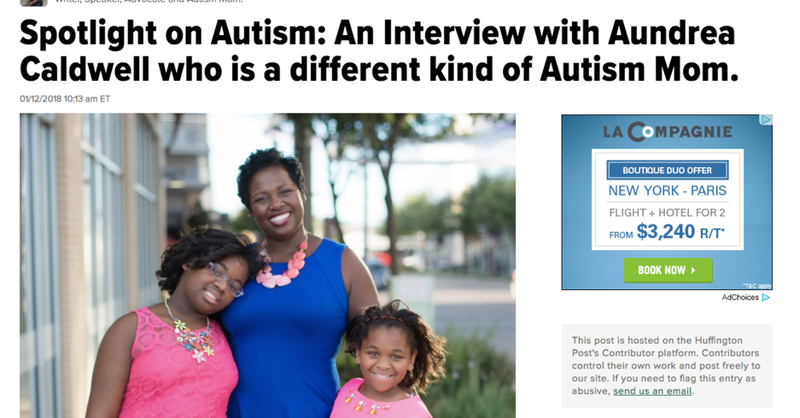 On Friday, January 12, 2018, I was featured in the Huffington Post for an interview I did last month with Contessa Cooper, a Huffington Post contributor and Autism Advocate. I got the opportunity to share my autism journey and the reasons why I call myself the "Not So Typical Autism Mom." I hope you enjoy the article and appreciate my insights for accepting and advocating for ASD children. There's more to come so be sure to sign up for my email updates on the book.